I don't usually cover speaker here at Audiophile On you can't simply have a large range of speakers sitting about your house to review, the size and setup are just slightly prohibitive. However, I do love HIFI systems in general. The experience is just completely different to Portable Audio. For the past few years I have owned the Dali Lecktor 8 and have been perfectly happy with them but this years show has left me with an urge for something different in the future. 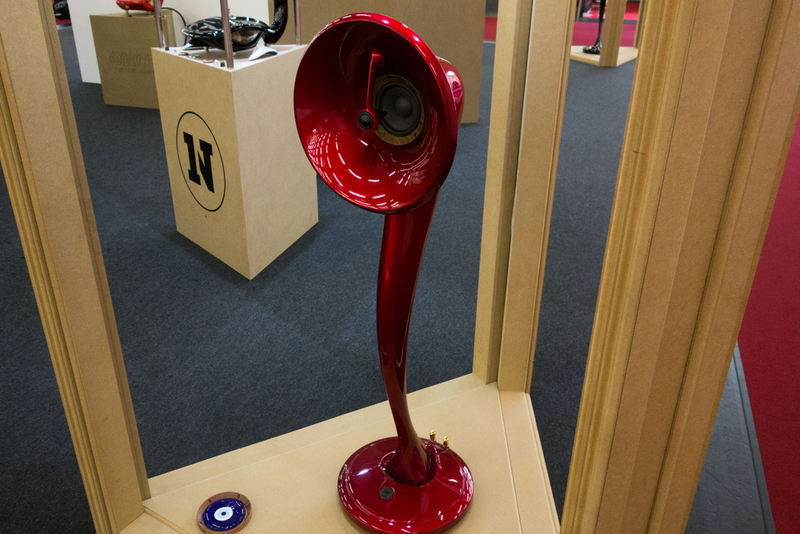 One of the companies that caught my eye at this year's high end show in Munich was the Turkish speaker maker ONCE Custom Sound. The company is based out of Istanbul, Turkey where, I was told they would soon have a demo location sometime in June. The best way to describe the speakers and system from ONCE is crazy. Swooping streamlined aesthetics give a strange mix of futuristic yet classical design. The companies current all in one system, the Su is the real beauty. It has the appearance of a modernised gramophone with its large diameter speaker swooping out from the Base unit where the single Electro Harmonix 6922 tube amp is located (the Su is in fact a hybrid system with integrated solid state amp technology located internally). The unit is bluetooth compatible and sounded very impressive from what I heard. It would look beautiful when placed in any living room but I expect it will do really well in the middle east markets such as Dubai. Its something I could see myself using. The new product from ONCE is the Nar a floor standing speaker featuring the same design cues as the Su it's to be used with a full system setup and yet again looks incredible. You will need more available space to house this speaker but it's a grand looking piece that will be sure to impress visitors as well as filling a room with some stunning audio performance. Check out the pictures from the ONCE booth in the gallery down below. Note: If you want to find out more information about ONCE Custom Sound you can visit the companies website right here.